The head girl and boy of Finham Park School, Coventry, introduced a video that they have produced to explain what students and staff have gained from the recent introduction of RJ into the school. 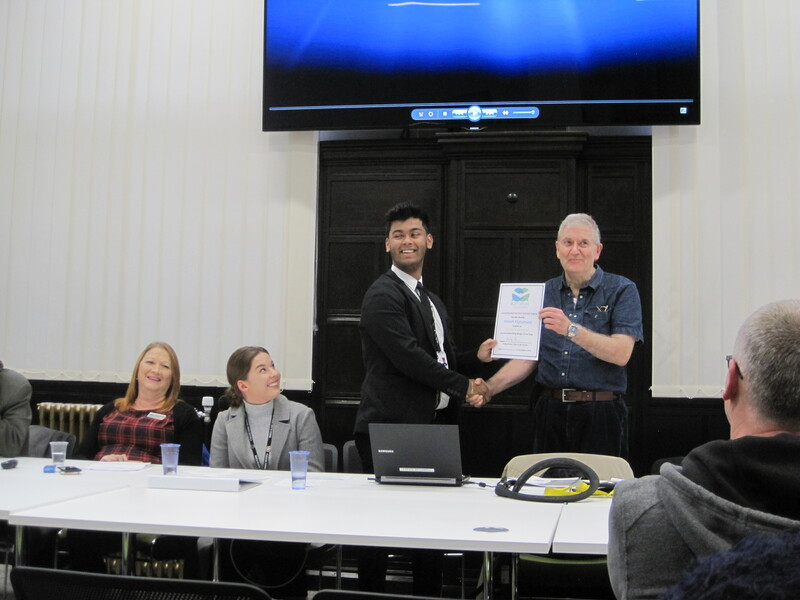 This was followed by a presentation of a certificate and small award to Vinesh Vignarasa for his excellent work in not only creating the video but also the new logo for Coventry RJ Forum. Next Mr Clifford Grimason talked about his work on RJ in a prison and an ex-prisoner told how RJ had transformed his life, culminating in his recent marriage. Heather Bailey-Wright explained how she coordinates the Community Justice Panel within the city of Sheffield. She has a team of about 20 volunteers who deliver RJ following training she provides. The expert panel included Lynette Kelly, Councillor in Coventry and Assistant West Midlands Police and Crime Commissioner (PCC). The delivery of RJ within the city (and the West Midlands) is in a state of flux because the PCC has recently awarded a contract to Remedi to deliver RJ to victims of crime within the West Midlands. Remedi’s West Midlands Manager Michelle Bailey discussed the work she was doing to set up the new service. Michele Birch gave the police’s point of view as the Supervisor of RJ within the West Midlands Police. Annalise Hill explained what she is doing within the Staffordshire Citizen’s Advice Hub and Nick Jeffries talked about the Coventry Youth Offending Team’s RJ service. Emma Clarke talked about her role as RJ lead in Finham Park School and Barbara Tudor from the Probation Service talked about the long and distinguished provision of RJ in the past and her hopes for the future. Many ideas and suggestions were made about how Coventry RJ Forum could raise awareness of RJ and raise the cash to fund a Community Justice Panel coordinator within the city. We will now approach the long road that no doubt lies ahead with greater confidence until we reach our goal of making Coventry a Restorative Justice City.